No, I’m not talking about cracking jokes. 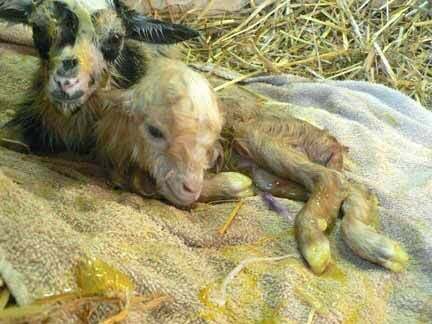 When they give birth, cows calve, sheep lamb, and goats kid. Because calves are so big and lambs are born with a wool coat, winter birthing doesn’t cause anywhere near the issues that it does for goats, which are smaller and have less insulation. The smaller the goats and the lower the temperature, the more you need to keep an eye on goats that are close to giving birth. You need to get kids dried off as quickly as possible when temperatures are below freezing because of the risk of hypothermia. And if it’s windy, and the goat is outside, a kid can get hypothermia at fairly reasonable temperatures. When we were very new to goats, we almost lost a doeling to hypothermia when her mother gave birth unexpectedly in the pasture on April 1. Although temperatures were in the 40s, it was very windy, and the doe had triplets. After seeing that doe give birth in many subsequent years, I know that there would only be seconds between the births of the kids, so it would have been impossible for her to get all of them cleaned off before they would get chilled. So, in some cases you need to be there not because a doe might have problems but because she gives birth too easily and too quickly. A kid can lose the tips of its ears to frostbite in just a few minutes if it’s wet and temperatures are below zero Fahrenheit. It can die from hypothermia fairly quickly at those temperatures when soaking wet. At this point, a lot of people ask, “Doesn’t the mother clean it off?” Well, sure the mother will lick it, but her tongue is small and wet, and I’ve discovered that the definition of “dry” is very different when temperatures are below zero and when they are more reasonable. 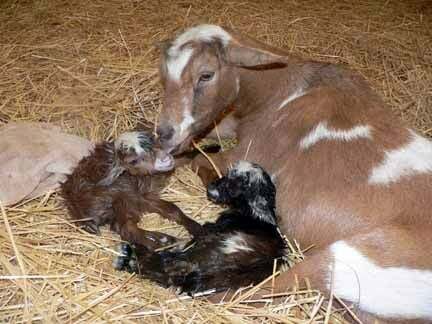 The first time kids were born on our farm at below zero temperatures, I was there, as well as both of my daughters. We had a stack of towels, a blow dryer, and a heat lamp. We dried the triplets as much as we could with the towels, and then we turned on the blow dryer. At that temperature, the blow dryer has to be within a few inches of the kid, or the air will be cold! After 45 minutes, we thought the kids were dry, so we turned off the blow dryer. A few minutes later, one of my daughters realized that the tips of the kids’ ears were starting to freeze. Rather than being nice and soft and warm, they were feeling hard and crunchy and cold. So, the blow dryer was turned back on! Unfortunately, in spite of our best efforts, one of the kids still lost the tip of one ear to frostbite. The second time a doe kidded when the mercury fell below zero, we were focusing so much on the ears that their tails started to freeze, so it is important to keep moving the blow dryer across the kids from nose to tail. And although we haven’t experienced it here in Illinois, a breeder I know in Canada has had kids wind up with frozen feet, in which case the kids may have to be put down. Several years ago I also started using a heating pad. It’s as much for me as it is for the kids. I put it on my lap, and put the kids on it while blow drying them. It helps me stay warmer, and it warms up the bottom half of the kid while I’m blow drying the top half. When a goat gives birth, I usually wind up being in the barn for two hours or more, and even with all of my winter wear, I can wind up way too cold. After one birth in really cold weather, I remember laying in bed with an electric blanket for more than four hours before I was warmed up. Once the kids are dry, they don’t seem to be bothered by cold weather much. However, this can vary depending upon the kid’s size. 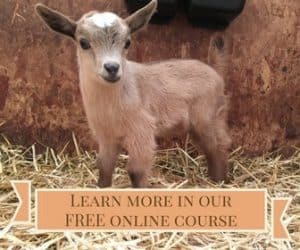 Standard breeds of goat kids don’t usually need anything in the way of additional warmth, but the smallest of pygmy or Nigerian dwarf kids (2 pounds or less) may need a little coat or a heat lamp. Keep in mind that heat lamps are the number one cause of barn fires, and if you use one, make sure there is no way that a curious goat can knock it down. If the heat lamp winds up in the straw or wood chip bedding, it can easily ignite a fire. The coat pictured can easily be made from the sleeve of an old sweatshirt. 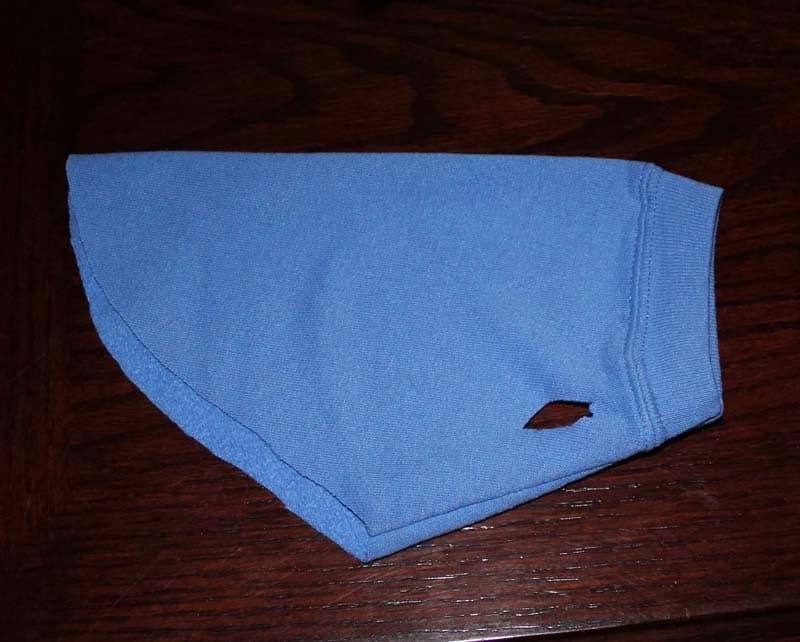 The wristband of the sweatshirt becomes the neck band for the kid. Cut two small holes for the kid’s front feet, and you’re good to go! Remember, if the kid is a buck, you need to be sure the coat doesn’t go under his belly far enough for him to be able to pee on it. If you would like to know more about caring for your adult goats in cold weather, you can check out our previous post on Goats in Winter. Great idea for the little sweater coat! So cute. These stories are so great! Thanks for the information! Very helpful info! My sweet husband worries about our doelings getting cold. You've saved me a lot of money on my electric bills. We had a baby Nigerian Dwarf yesterday. We are new to goats so I was worried with fairly cold temperatures arriving on Monday. Your article has helped ease my mind a bit. I will still be checking her quite often, but I'm not as worried as I was. Thanks! Very good. We use wooden boxes that my dad made and baby pj’s . We use the blow dryer and warm up the box and put the kids in after they eat. I’m somewhat North in Canada. No electricity. Any suggestions? A 4 foot by 4 foot “lambing jug”. Give it a solid bottom half to keep drafts off the babies and bed with a good layer of straw. The mama’s body heat will warm it. I put a little jacket on the babies until they are dry, especially important if they are still damp when nightfall comes. I’m a new goat owner (about 3 months) I have 2 under a year old & a yearling doe who’s due Feb 7th. I live in Wyoming & it’s COLD. Can I take the kid inside just long enough to get it dry, then bring it back to the doe? Do I need to be right by mom to ensure they bond? I’m really worried the kind of cold around here will be too much! I’m considering taking Candice into the shop, adding deep bedding & doing a make shift stall in there for the first week. We get 4 ft drifts of snow, can get a foot of snow that melts into a pond of freezing water… any other tips would be well appreciated! I want to be completely prepared! There are no guarantees — especially with a first freshener. They can be kind of clueless to begin with, so any disruption at all can wind up causing them to reject the kid(s). If it looks like it will be way below zero Fahrenheit, it might be a good idea to take them into the shop. Try to keep the heat down as far as you possibly can. I know a lot of thermostats don’t go any lower than 50, but if you can get it cooler than that, great! One time when it was that cold, I put a new mama and babies in our barn office and set the temp at 50, and we put the mama and kids back in the barn when the temperature outside warmed up to 20 degrees, so it was only a 30 degree change when they went outside. But then it got colder again, and they were fine because the temperature changes are happening over the course of hours or even days. A sudden temp change is hard, so just try to avoid that. 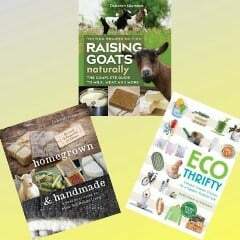 What does it mean to “jug” a momma goat? That is actually a sheep term. Shepherds put ewes in a lambing jug to give birth. I use the term kidding pen for goats. So, to jug a ewe means to pen them. Glad to hear you find the info helpful!